Immature Myzocallis castanicola (see first picture below) are yellowish or greenish with some brown-black dorsal markings. All adults are winged (see second picture below). They are yellow, with the wing venation distinctly outlined in brown and forewing veins ending in brown spots (cf. other oak-feeding Myzocallis whose wings are not distinctly outlined in brown). They are distinctively marked with a dark median strip on the head and thorax, and paired black spinal and marginal patches on the dorsal abdomen. Their antennae are dark beyond the basal half of the third antennal segment. The tips of the tibiae and tarsi are dark, as are the forewing veins which end in fuscous spots. The siphunculi are also dark. 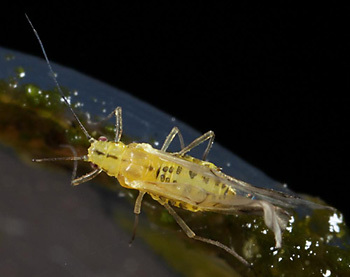 The body length of Myzocallis castanicola alates is 1.6-2.3 mm. 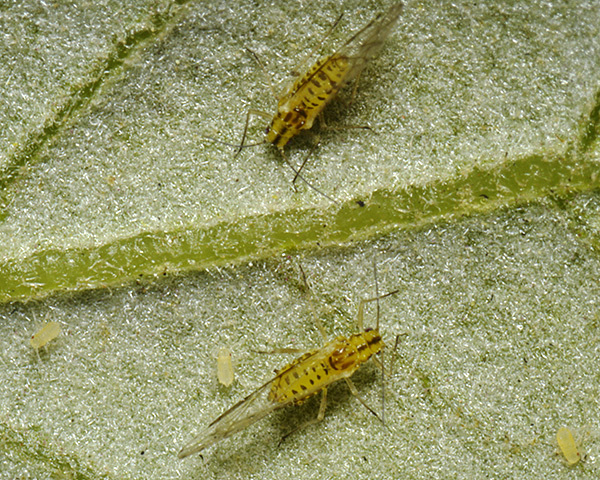 The sweet chestnut aphid is found on the undersides of leaves of many chestnut (Castanea) and oak (Quercus) species. Myzocallis castanicola is found in Europe, Middle East, southern Africa, Australia, South America and western North America. Myzocallis castanicola can be found on several tree species, all in the Fagaceae (oaks and chestnuts). The species is often abundant on sweet chestnut (Castanea sativa), from which the species takes it scientific name (castanicola). The picture below shows an unusually lightly marked specimen on sweet chestnut in East Sussex (compare with the heavily marked specimens feeding on english oak below). Apart from a few Lachnus species, Myzocallis castanicola is almost the only species of aphid worldwide that feeds on sweet chestnut. 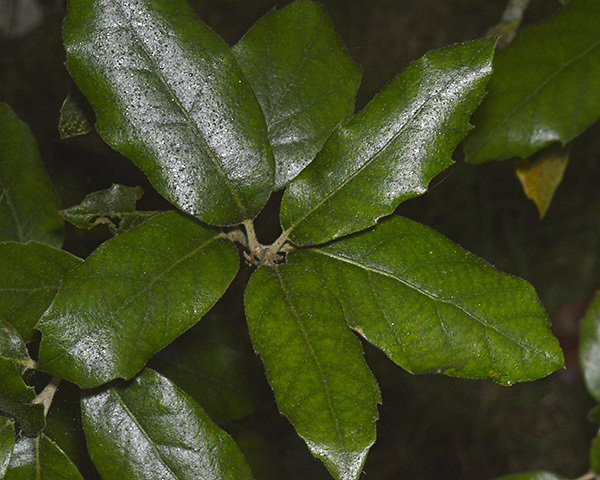 Sweet chestnut is characterised by having both hairs and stalked glands on the leaves (Viéitez, 1992). Such structures have a defensive purpose against herbivores which may well be why so few aphid species have adopted sweet chestnut as their food plant. 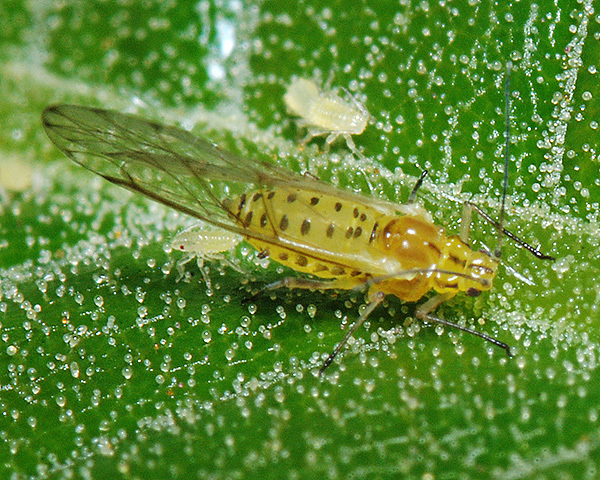 Note that the glands are especially concentrated near the midvein and side veins - the optimal aphid feeding sites. 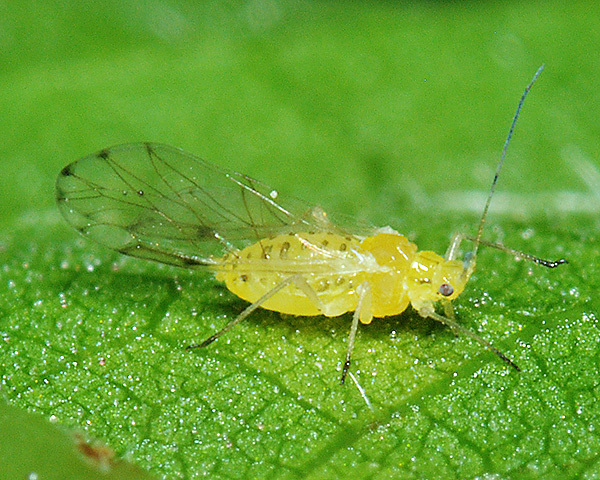 Myzocallis castanicola also occurs on English oak, a host it shares with a very large number of other aphid species. Despite the competition, it can occur in large numbers on Quercus robur. Ratajczak & Wilkaniec (2011) looked at the composition of the tree-feeding aphid community in the Kornik Arboretum in Poland. 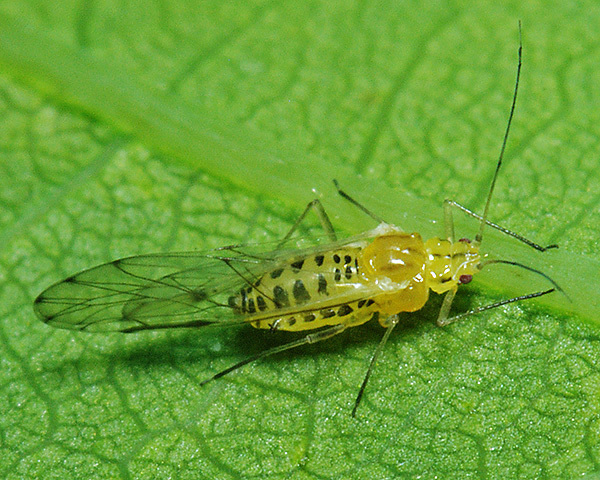 Whilst the beech aphid Phyllaphis fagi was the commonest aphid, making up over 20% of the aphids collected, Myzocallis castanicola was still classified as subdominant, comprising 5-10% of the aphids collected. Identification of Myzocallis castanicola on Quercus species can be made a little more difficult by the great variation in how heavily specimens are marked. The specimen above is strongly marked, with the head and thoracic markings clearly distinguishing it from other species on oak (compare with the lightly marked specimens feeding on sweet chestnut above). Quercus ilex is another plant that presents a difficult habitat for aphids as the young shoots and lower surface of the leaves are covered with very smooth trichomes. 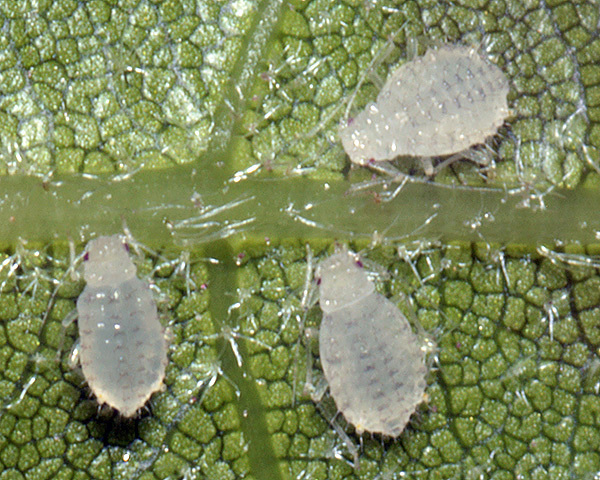 Nevertheless about 30 species of aphids worldwide are known to feed on Quercus ilex, including Myzocallis castanicola (see picture below). Another holm oak feeder, Myzocallis schreiberi achieves attachment to the trichomes on the lower surface of Quercus ilex using flexible pretarsal empodia (Kennedy, 1986). It seems likely that Myzocallis castanicola has the same adaptation. Myzocallis castanicola is not attended by ants, despite the fact that it is likely that the honeydew produced would appear very palatable to them. Lombard (1987) examined the carbohydrate composition of the honeydew produced by Myzocallis castanicola and found melezitose to be the main component of the trisaccharide fraction. It is quite possible the sugar concentration is too low. However it might be consumed by ants and wasps gleaning partially dried honeydew from the leaves, rather than directly from the aphids. 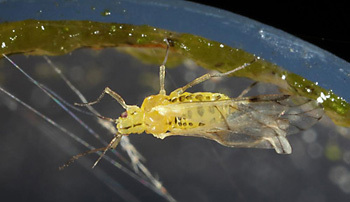 Barta (2009) reported the fungal pathogen Entomophthora planchoniana attacking Myzocallis castanicola, as well as other Myzocallis species. Myzocallis castanicola has been recorded from 4 Castanea species (Castanea crenata, Castanea dentata, Castanea pumila, Castanea sativa), and from 22 Quercus species. Blackman & Eastop list 10 species of aphid as feeding on sweet chestnut (Castanea sativa) worldwide, and provide formal identification keys. 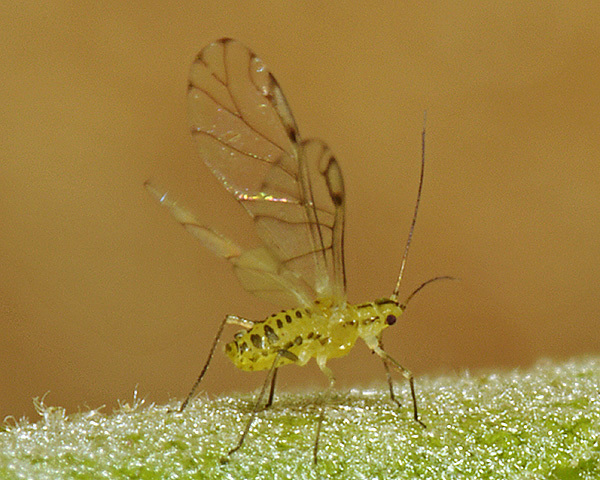 Of those aphid species, Baker (2015) lists 5 as occurring in Britain: Lachnus longirostris, Lachnus roboris, Myzocallis castanicola, Thelaxes suberi and Tuberculatus annulatus. 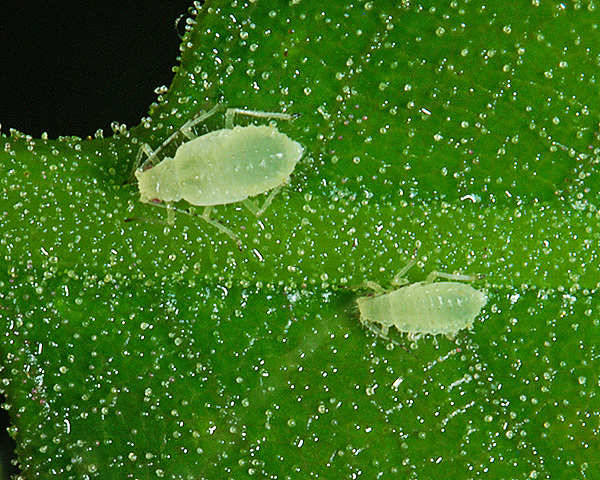 Blackman & Eastop list 34 species of aphid as feeding on common or pedunculate oak (Quercus robur) worldwide, and provides formal identification keys for aphids on Quercus. Blackman & Eastop list 25 species of aphid as feeding holm or holly oak (Quercus ilex). 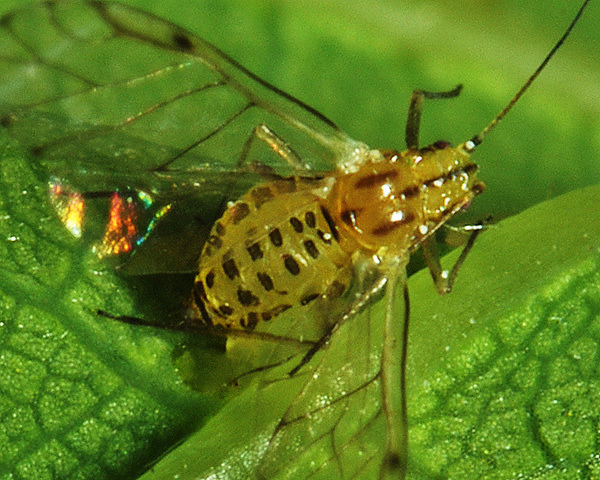 Of those aphid species, Baker (2015) lists 10 as occurring in Britain: Hoplocallis picta, Lachnus longirostris, Lachnus roboris, Myzocallis boerneri, Myzocallis castanicola, Myzocallis schreiberi, Stomaphis quercus, Thelaxes dryophila, Thelaxes suberi and Tuberculatus annulatus. Can you verify this as Myzocallis castanicola for me please, [it] was in the garden here this afternoon, must have fallen off our Quercus rubra, directly above. Thanks. The species isn't even on ERICA, our [Cornwall] county database. Certainly looks like Myzocallis castanicola, but I can't say it's definite simply because it was off its host. We have found Myzocallis castanicola nearly everywhere we've looked for it, so I suspect it's very widely distributed.